The UCD School of Biosystems and Food Engineering is leading the €8 million Horizon 2020 AgroCycle research project involving a consortium of 26 partners from the EU, China and Hong Kong, to create a protocol for the implementation of the ‘circular economy’ across the agri-food sector. The project will contribute to setting policy direction at EU level, and envisages significant global impact. 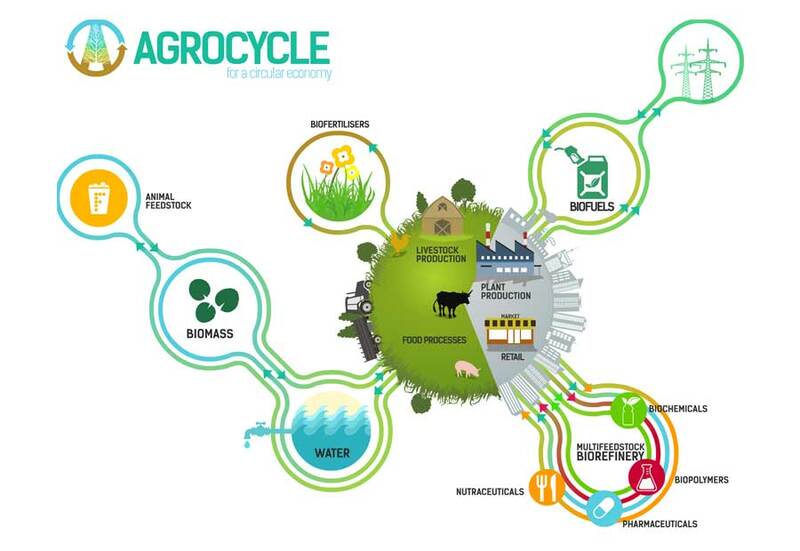 AgroCycle addresses the ‘circular economy’ by reducing waste all along the chain, and utilising waste as a feedstock for downstream industries such as pharmaceuticals and biochemicals. “The European Commission recognises how vitally important it is to invest in agri-food research and innovation,” said Phil Hogan, EU Commissioner for Agriculture and Rural Development who launched the project at the inaugural meeting of the AgroCycle consortium here at UCD. “Research must deliver practical solutions in the field and at every other link of the food chain. I know this same principle strongly informs the work being done at UCD. Professor Shane Ward, UCD School of Biosystems and Food Engineering, will coordinate the project. 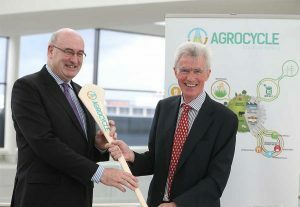 Professor Shane Ward, UCD School of Biosystems and Food Engineering, presents Phil Hogan, European Commissioner for Agriculture and Rural Development, with the AgroCycle hurley during the launch of the €8 million AgroCycle ‘circular economy’ project. “AgroCycle was one of just two projects funded under the particular Horizon 2020 call, out of over 180 applications. This speaks volumes for the consortium and UCD’s global standing” said Professor Ward. AgroCycle will focus on the development of a sustainable bio-economy underpinned by the agri-food sector. The AgroCycle protocol aims to deliver a 10% increase in agricultural waste valorisation by 2020 and will address pathways to deliver downstream industries including pharmaceuticals, biochemical and the production of bio-fuels and microbial fuel cells – an emerging technology based on the production of electricity from organic material. AgroCycle is a Sino-EU collaborative research venture, funded by the European Commission under its Horizon 2020 programme (€7 million), with additional funding (€1 million) from the Governments of the Peoples’ Republic of China and Hong Kong.